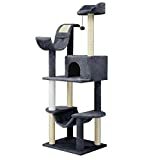 Cat trees, also known as a cat tree tower or a cat scratching post, are a great way to increase vertical territory because they provide the opportunity for more than one cat to share a close space while maintaining any sort of pecking order. A cat tree can serve more than one function for your cat as well. In addition to being a great place to perch, the support posts can be used as scratching post. A cat tree might be a good way to reduce feline conflicts in your home because it gives them a place to escape to. When purchasing a cat tree consider your cat size, personality and location. You want your cat to be comfortable and have fun. If your cat is large, maybe consider a cat tree with large perch for comfort and a good place for relaxing and sleeping. Location is also something worth considering; where about in the home will you place a large item like this and is it going to be in a room that your cat actually migrates to? We have selected 10 of the best cat trees that will be ideal for your home. Who’s to say really which cat scratching post is the best?! We have looked at them in terms of style, cost, and durability to try and bring you ten posts we think would be worth having. 10 Best Scratching Posts & Cat Trees. This is a purrrfectly gorgeous, stylish (grey, we like grey!) and cozy cat tree with multiple platforms and hidey holes for your cat to enjoy. With sturdy construction made from natural particle boards and robust supporting tubes to hold the platforms, to extra thick plush material for comfort and natural sisal for stratching, this is a cat tree that comes highly rated by many cat owners! It is reasonably tall at approx 154cm, and the base board is 50x50cm, but they also come in different sizes should you need something a little smaller or even larger! This holds 1-2 cats comfortably. It features hammock, condo and top perch and fluffy toys for fun. Buskers Cat recommends! Extra-thick plush is super comfy and resistant to wear. Provides luxurious look If your cat loves luxury. Easy to assemble: All components are clearly marked, detailed instructions and tools are also provided. Multiple levels to jump around on, can accommodate 1-2 cats. This multi-tier 130cm high cat tree keeps your cats from scratching your furniture. It is constructed of skin-friendly particle board with soft plush. The natural imported sisal rope covered posts, hanging balls, comfortable perches build a palace for your cats to climb, scratch, play and rest. It also comes with strap to attach to the wall, and with three platforms, two condos and perches, this would suit more than one feline friend (max 10kg). Easily assembled saving you time. Suitable for several kittens to play and will keep your cats entertained. Accessorized with hanging balls which your cat can play with as toys. Can be good for multiple cats to perch on as it has multiple platforms for cats to climb, scratch, play and rest. Skin-friendly particle board covered by soft plush material. Comfortable palace for your cats that will keep them from scratching your furniture. Heavy duty and stable can accommodate cats Max Load up to 22 lb. /10 kg. This is a height adjustable, easily assembled floor to ceiling three tier cat scratch post. It is covered with beige faux fur and sisal. The three platforms are 45cm total width (25cm ledge). Recently improved extra large baton strengthened platforms for durability. This post is a bit different with its floor to ceiling minimalist design! The only thing to note particularly is that some other cat owners felt the ledges were a bit small for their cat, so bear in mind if your feline friend likes space to spread out. Height adjustable from 240-288cm but can be reduced further to a minimum of 234cm by hand sawing the adjustable tube. If you want to get your cat a tree that doubles up as a bed which you don’t need to spend lots of money on, Oxgord cat tree will suit your cat personality and your pocket. A good deal for the price as the scratch rope will save the side of your couch from relentless scratching attack attempts from your cat. Comes with natural sisal posts and rope are the purr-fect scratching aids for your cat’s claws. It’s built sturdy and it’s a perfect size. The height is up to a normal doorknob making it high enough for your cat to view his surrounding from up there. Multiple sturdy climbing and sitting platforms and a padded top perch to accommodate multiple cats if any. 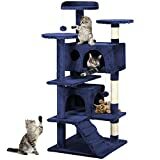 This cat tree is the best multi-level cat tree tower complete with cat house condo for privacy also includes fun, interactive toys to keep your pet entertained and active. Scratch pole is great for Small, Medium, Large, Young Kittens or Even Big Old Senior Cats. Beautiful design as it is constructed from pressed wood wrapped in beautiful faux fleece. Easy to Set Up. Comes with assembly instructions. The cat tree’s scratch posts are covered by sisal rope. Perfect for your cat to scratch, sleep, play or purr on for hours. The play area is multi-level stable, bringing maximum joy to our pet as it has fun around the tree. Easy to clean just spot clean soiled areas with mild detergent or soap. Blot rinse and air dry. We like the curved top perch and the high sided one next door to it, providing two really cute and cozy places for your feline friend to sit and relax in peace! This multilevel cat tree comes in grey and beige, to compliment home decor. It can hold upto three cats at a time. Made from safe, non toxic materials, with natural sisal rope for the 4 scratch posts, and MDF for the platforms, it is sturdy and strong for when your cats come to play or snooze. Awesome playhouse for your cat to relax, exercise and have fun indoor. Does not take up much floor space and easily complements your home decor. High quality MDF and sturdy posts that firmly hold the structure. Can perfectly accommodate 3 cats (each less than 15lbs). Material is non-toxic, safe for both your family and pets. Easy to assemble with step by step instruction and tool included. 4 sisal scratching posts to cater to your cat’s natural habit of scratching, allows it to sharpen its claws on the cat tree instead of your furniture and walls. Let us tell you what we think about this cat tree – the design comes in five colours including pink!! 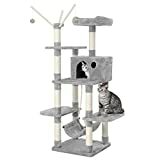 Yes, alongside the decor matching shades of beige and grey etc, is one bright and eye catching cat tree, so this one had to make our list. What this cat tree also offers is cute detail like the four hanging plush mice toys for entertaining, and a round hammock from the side which looks super cozy. The ladder at the bottom looks like fun, particularly for kittens. 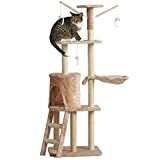 With sturdy and durable sisal posts for scratching, and strong construction, this cat tree is Cozy Pets‘ best selling design and we can see why. Easy to assemble with instructions and tools. Oh, and the price – great value for money too! A heavy duty sisal play rope, 3 viewing spots a hammock and an extra-large cat house provide your cat with a wonderful place to play, exercise and sleep. Very strong construction with extra thick posts all in neutral beige which looks great with any interior décor. Heavy duty sisal scratching posts help keep your cat’s claws in great condition. Comes with simple instructions and all the tools you need to quickly build it. Large base making it more stable and an extra-large house suitable for larger cats. Owing to their size, cat trees can end up becoming part of the furniture of the room. Well, here’s a cat tree that really does look like a nice sleek addition. The 56cm square base isn’t too large however, and at 121cm high it isn’t the tallest tree we reviewed. The walnut laquered MDF is really eye catching, complements the sisal posts and cream memory foam cushions which provide top quality comfort. This tree comes with one ‘cube cave’, two platforms and a rattan ball hanging toy. This is a highly rated product by other pet owners too who appreciate its style and sturdiness. This is a tall, easy-to-assemble, and sturdy cat tree. 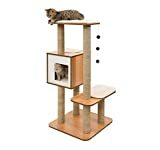 Your cat will love this tree as they can use all aspects of the cat tree, from the scratching posts to the dangling mice. This is a low cost but attractive cat tree with multiple features; three viewing platforms, hammock and cat house, with ladder and plush mice. Tough sisal covered scratching posts will help to maintain your cats claws, keeping them sharp and healthy. They’ll also come in handy if your cat has taken to using expensive carpets or furniture as makeshift scratching areas. A fantastic way to keep your cat active indoors when the weather takes a turn for the worse. Sturdy construction with plush beige fabric will blend in beautifully in your home. 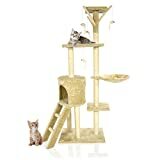 Large plush 3 tier cat play tree – keep your cat entertained for hours! 3 toy mice, 3 viewing spots, hammock, cat house and stairs will give your furry friend a fun place to play, exercise or settle down for a quiet cat nap. Tough natural sisal covered scratching posts help to keep claws sharp and healthy. 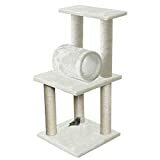 This is a three platform simply designed cat tree with 7 scratch posts wrapped in jute. The very top platform is a circular shape with sides, allowing it to double as a bed for a safe cosy place to sleep. The tree is made from MDF, carpet, jute and paper tubes. It is simple to assemble with all instructions. With its square-shaped base, the Amazon Basics cat tree provides reliable stability and can safely accommodate more than one cat or kitten at a time. We like how it is a neat and compact design without lots of attachments sticking out the sides – great for a corner of a room. Triple-platform indoor cat tree with 7 scratching posts wrapped in jute for your cat scratching fulfilment. Round top platform with sides and curved top rim doubles as a cat bed. Easy to assemble-Simple screw-together—instructions and tools included. This cat tree is ideal for large cats as it is very strong, made from high quality materials. New improved design with extra heavy and strong plush, quality natural sisal full covered scratching posts. The top bed with detachable pillow looks good enough for us to climb in, if only we were small and agile enough! Very steady and 120 cm height with very large relax place for your large cat. This is a high quality Dutch brand which is popular accross Europe. We can’t ignore a heftier price tag compared to other reviewed products, but it is so very highly rated as a strong and sturdy high quality item that we couldn’t disagree! Very steady construction, your cat won’t tumble over. Easy to clean with its removable pillow. Ideal for large cats with its large relaxing place. Extra heavy and strong plush quality sisal making it durable. High quality sisal good for cat scratching. Blend well with your home décor with its stitched pillow with Velcro. A cat tree can give your pet a sense of security, space and comfort in their own home, with a place of their own to play, scratch, stretch and sleep. Keep him off the furniture with the allure of natural sisal posts to keep his claws healthy, and let him have a nice view of outdoors from an elevated position. There are plenty of cat trees available,so choose one today that suits your feline friend and your home.